The HQRC has a 2400ws Quartz Flashtube plus a modeling light. The Next Generation Heads look the closest to the old classic design because they have the round cylindrical shape to the body. The attached 3-7 foot long Coiled Head Cord will connect to any Lumedyne Power Pack. There are two sync jacks on the rear of the Head, both the household style and the mini-phone sockets are available. The Head includes the 2400ws Quartz Flashtube, modeling lamp, five inch reflector, two diffusors and a metal snoot. 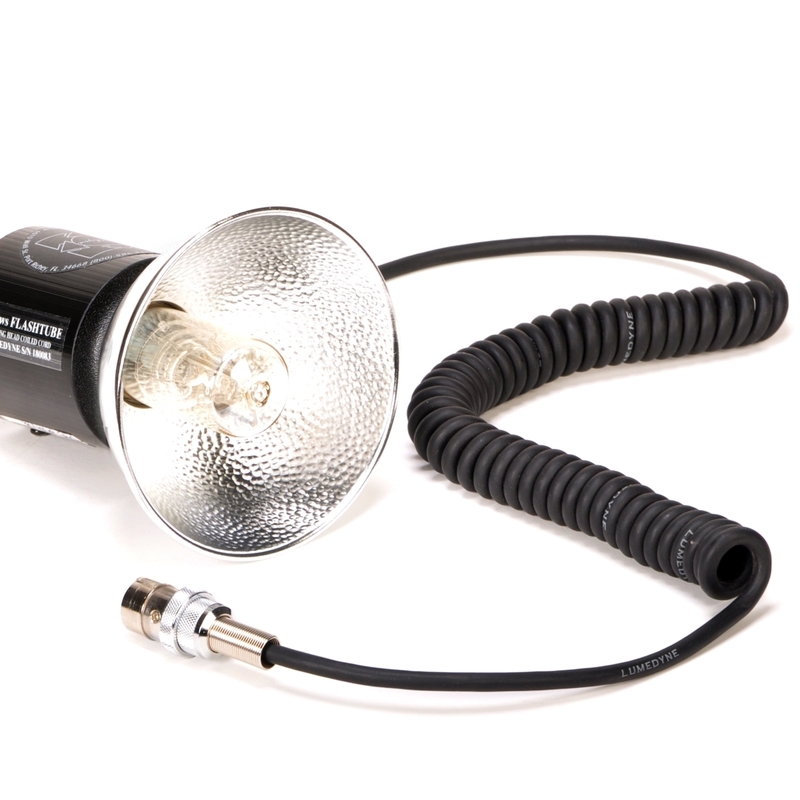 The HQRC has the 2400ws Flashtube making it perfect for high power use or use with the Action Packs. Next Generation Flash Heads can connect to all the Lumedyne Power Packs. They have built in head cables and the HQRC has a 3 to 7 foot coiled cord. The body of the Next Gen’ Heads look a lot like the Classic Heads because the lightweight round design is so easy to handle and pack for travel. Those photographers who carry their Heads on a camera bracket appreciate that these are lighter than most other options. The Next Generation Heads have a safe low sync voltage on both of the sync jacks (household and mini-phone) so they can be connected to cameras or slaves without worry. They can be test fired or have the modeling light turned on/off with the buttons near the sync jacks on the rear of the Head. While the Heads are made with a plastic shell, they are still quite capable and can be used with a wide variety of light modifiers. The main advantage is their weight since they weigh less than a pound. Some people appreciate the head cable being built into the Head, “one less thing to forget” and it is possible to have the Heads built with custom longer lengths of straight head cords. Contact Lumedyne directly for more information about customized products. The HQRC's head cable is a little longer than three feet before it is stretched and can stretch to longer than seven feet before the cable begins to get "stretched out". It also includes an 2400ws Quartz Flashtube (AFTQ) and a separate Modeling Bulb (AMBR) protected with a 5 inch reflector (ARST) and two diffusor covers (ADC1 & ADC2) plus a metal snoot (ASNT).